I am indebted to Chris Batten and the Methodist Church Council for giving their permission to republish this account of the Methodist Church in Woburn Sands. This work was compiled by the then incumbant Minister, Trevor Dale, and published in 1979 to celebrate the centenary of the church. St. Paul used sporting metaphors – the athlete in training, the prizes competed for in the games, boxers ‘beating the air’. Perhaps I can stand in that apostolic succession. A “Not out century”. What an achievement! The dream of every budding cricketer and given to some to attain. What labour and patience, what mixture of good, bad and indifferent play, what pedestrian plodding and moments of inspiration, go into it. It is not a bad analogy for our Churches Centenary. In this history you will read of some of the high spots of the past – and some of the personalities. But of course, there have also been the times of patient and unremarked ‘plodding’, and a host of loyal servants of God whose service is unrecorded because it was quite ordinary. None the less, without these times and people, the century would not have been reached. For them all we record our gratitude to God. We owe them much. And what now? My old sports Master, trying to teach us the rudiments of cricket, used to say “Gentlemen, in unlikely event of your ever scoring a hundred, acknowledge the applause, then take fresh guard, and start again“. I never had the chance to put his advice into practice – but something tells me he had got it right. As a Church, we look back with gratitude – and take fresh guard to make a new beginning. From Rev. J. Bailey Chapman – Supernumerary – Newark On a recent visit to Harrow my wife and I decided to go by way of Woburn Sands and call upon Nanny Perry to whom we are indebted for many kindnesses during our time in the village. It was a joy to see her and also Mrs. Faulkner who happened to be there. As I glanced at the names in the High Street, Pikesley’s Garage and Wesley’s Hairdressers brought back many memories as also the Post Office, where on occasion I went to phone. We were at Woburn Sands during the war years from 1940 to 1944 and remember the troops stationed there particularly the K.R.R. and the Pioneers Corps, one member of which sang in the choir and became a friend with whom we still correspond. A great piece of work done by the Church was the Canteen held in the small school room at the foot of the steps. We had a good Sunday School and Choir and remember with affection the fellowship of the Guild. We send every good wish for the future from my wife and myself. From Rev. Arther Manley – Supernumerary – Kettering My wife and I recall our comparatively short stay at Woburn Sands with great pleasure and convey our congratulations and greetings on the occasion of the Centenary celebrations. I served as a chaplain in the R.A.F. and was demobbed in September 1945 with three months paid leave. But, an emergency arose at Woburn Sands and I received a request from Home Missions to take up the appointment for one year as from October. I hesitated because I had another appointment in mind for 1946. However, I said ‘yes’ and never regretted it. Everyone received us with great kindness. Ration books were still in use. I recall my visits to the farms at Moulsoe and where ration books were not required! Some words fail me to tell of the characters of 30 years ago. Suffice it is to say that I did not take a further circuit in 1946. That is a tribute to the happy days spent at the Sands. I had a side line. How many remember it? I kept 12 ducks. May your celebrations reward you with all you anticipate. From Rev. Percival Davies – Supernumerary – Hereford Greetings and congratulations on the occasion of your Centenary Celebrations. I have happy memories of my stay with you, 1948 – 51. The leafy, sandy mazes of your woods remain in my mind, and the walk through them to Bow Brickhill is not likely to be forgotten. Not so pleasant was the noise of heavy lorries changing gear at the top of the hill outside our bedroom window as they speeded through the night from Northampton and the north towards London. I recall places but also people. Will Smith and Alderman Sykes were men whose quality would add distinction to any church, Mr. Piper’s cheerful optimism was infectious. He never wore an overcoat, summer or winter, because, as he told me, he had taken his mother’s advice and had stuck to flannel next to his skin! Mr. Whitmee’s opposition to all forms of alcohol and read prayers was a byword amongst local Methodists! Space fails me to tell of many more whose names and services come rushing up through the years as I reflect on my ministry in Woburn Sands. They have all built into its present, something of the faith and quality of their own lives. You who worship there today will make your own contribution to the success of the ongoing years. May your Centenary Celebrations give a new impetus to that progress. From Rev. Robert R. Judkins – Sheffield North Circuit “100, not out” is the time for a shout of joy and congratulations. The Church is people and you have already celebrated your one-hundredth anniversary, but the Church that built the Chapel a century ago did so with faith and work. We entered into the product of their labour and I shared with you who were with us five happy years from 1961 in Christian service. The Chapel was the place of worship for my family when our children were young. We, with them, look back with gratitude to the house of God that was loved and well cared for, a symbol of the caring of people for each other and folk beyond the Church Family. Martin and Helen are now grown up. Martin is married with two fine boys in his family. We are that much older, but young enough in heart to know that ‘every day is a new beginning, every day is the soul made new’ that traditions are good if they stimulate adventure in service for the life and need of the present; that property is the tool of the people for the progress of the Gospel, and that in Jesus Christ, the same, yesterday and forever, is our continuing hope and joy. So, with you, we look back with thankfulness, upward with faith and forward with hope, and anticipate the pleasure of being with you during your year of celebration. I readily respond to the invitation to send greetings upon the occasion of the Centenary of the present Church building. Of course this present building, although 100 years old was not the first Church in Woburn Sands. 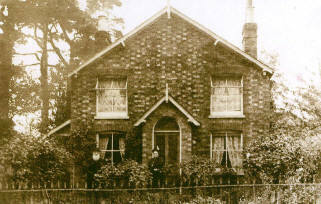 (it was built in Hardwick Road, and is now a house.) The fact that the “new” church was built suggests that our predecessors had great faith and that they also were people of a warm heart for this has come down to us across the years, afforded to us through the Gospel of our Lord Jesus Christ. I can speak of this welcome in personal terms upon being appointed minister here in 1966, I well remember the day of arrival at Woburn Sands when it poured with rain during the whole time of removal, but there was nothing damp or watery about the Stewards and others in helping us to get straight. They had a concern for others rather than themselves, was a vital part of their Christianity, and this must ever be for Jesus said that we had to love other people as He loves others, indeed this is His commandment – St. John 13 v 34. Yours Sincerely Ronald E. Thorne. The counties of Buckinghamshire and Bedfordshire, being situated on the route westwards from East Anglia and northwards from London, were frequently journeyed through by John Wesley on his evangelising tours of the British Isles. Occasionally he stopped to preach at places which are now part of the Milton Keynes circuit, but the nearest he came to Woburn Sands would seem to be Little Brickhill where the large number of people forced him to speak in the open air in spite of the keen east wind. He did, however, make an overnight stop at Woburn on Whit Monday 1753 whilst on a journey from Leicester to Markyate. At the time of Wesley’s death in 1791 a society had been started in Woburn Sands and was meeting in a house on the opposite side of the road from the present church and a little nearer the station. Betsy Inwood was the first class leader and founder of the Sunday School. During the first quarter of the 19th century a chapel was built in Hardwick Road adjoining the Friends’ burial Ground. The society grew and in about 1854 the building was lengthened and a gallery added. The 1851 religious census shows that there were 100 worshippers at the afternoon service with 71 Sunday School scholars, and 110 at the evening service. It has been suggested that these figures indicate that 33% of the village people were chapel goers. The nation at this time was in a state of agricultural depression and the intellectuals of the church were in a ferment following the publication of Darwin’s Origin of Species. Some of the horrors of everyday life had been reformed by the discovery of anaethetics and antisepsis, and the 1870 Education Act was to make life a more satisfying experience for many. In Woburn Sands the coming of the railway in 1846 had caused a rise in population and among the new residents was Mr. Benjamin Gough, a poet of some repute within Methodism. It was as a result of his influence that seven laymen and two ministers met on Wednesday September 12th 1877 in a room adjoining the Fenny Stratford chapel to arrange for the purchase of a piece of land in Woburn Sands on which to build a new Weslyan Church. The men were the Rev. J. Hall, superintendent minister of the Newport Pagnell circuit, the Rev. George Beebee of Woburn Sands, Mr. Grimes, Mr. Bodley, Mr. H. Inwood, Mr. Munsley, Mr. Neel, Mr. Stephens and Mr. Gough himself. The Swan Hotel had long occupied its place at the southern end of the High Street. The house now occupied by S. and S. builders was built in Georgian times and the Institute in 1874. Two plots of adjoining land were offered for auction on September 14th, and Mr. Munsley, with the authorisation of the Fenny Stratford meeting, secured them for a total of £565 with a deposit of £50. Five days later the Building Committee was formally constituted at Woburn Sands. The enthusiasm of this body to do God’s will in the situation in which He had placed them can be sensed through the words of the minute book and as a tribute to their faithfulness and endeavour, as well as for historical reasons, it is worth following its proceedings in some detail. Mr. Neel of Bow Brickhill was appointed secretary at the next quarterly meeting. Now began a long struggle to keep the building costs within the agreed limit of £1500. Mr. Bell’s first set of plans had to be reduced before building tenders could be sought, but even the lowest of these proved to be excessive and the architect was asked to prepare fresh drawings. Nearly seven months elapsed before these were available for the committee’s scrutiny and new tenders could be invited. Then on March 10th 1879 Mr. Robert Jackson convinced his fellow committee members of his ability to build to the accepted plans and remain within the cash limit. With his promise to begin work on the site the next morning the stone laying was fixed for Easter Monday. At the next meeting on May 28th he guaranteed completion by the second week in September and the opening services were arranged for Wednesday 10th September. The afternoon service was conducted by the Rev. V.H. Cornforth, the chairman of the Bedford and Northampton District, who preached on the healing of the Syro-Phoenician woman’s daughter. In the evening the President of Conference, the Rev. Benjamin Gregory, spoke from the text, “Nevertheless when the Son of Man cometh shall He find peace on earth.” St. Luke 18 verse 8. The chapel was full to capacity and tea was served between the two services. The celebrations continued until the end of the month and when the building committee met again on October 1st they began straight away to arrange for the building of the ministers house. This enterprise was subject to delays similar to those which had affected the church and the house was not accepted from the builder until May 1881. The minister did not then require the house so its first tenant was Mrs. Inwood who paid an annual rent of £25.0.0. One of the great legacies which John Wesley left his people was the system of question and answer whereby the material and spiritual state of a church could be assessed. If the trustees faithfully asked themselves the questions laid down and gave to each an honest answer no part of their property should fall into disrepair. The trustees at Woburn Sands have been such faithful and honest people and their books are a teeming record of repairs and improvements large and small. To recount them all would be tedious but a few are worthy of note. In 1894 the school­rooms proved to be too small and were demolished. The present arrangement of rooms was built in their place, the kitchen being converted in 1957. The church lighting was improved in 1895 by the positioning of two pendants with three incandescent lights in each over the aisles. The stairs to the schoolrooms were removed and redesigned in 1897 and two years later the approach to the church was paved in Staffordshire bricks. In this year also the ventilation system became faulty and services were held in the Institute while repairs were made. The start of the twentieth century saw some plumbing improvements: in 1904 a “sanitary arrangement” was fitted in the church for the minister’s use and two years later a bathroom was made in the manse. Further drainage work was carried out in 1911. The next major renovation work was undertaken in 1926 by Mr. Manning of Bedford and the memorial window to Mr. Inwood was unveiled by his brother, the Rev. Inwood, on March 11th. 1927. Also in this year Bacchus of Bedford overhauled the heating system and the following year they installed the electric lighting. The organ installation in 1936 necessitated the blocking off of the door from the vestry and at the same time the choir pews were enclosed and raised in the corner on the opposite side of the pulpit. At the end of the war work began again with alterations to the front of the chapel interior in 1949. Dry rot was discovered in 1956 and while it was being treated services were held in the schoolroom. Considerable redecoration was required after this and all was not complete until 1963. Two years later the stairs to the vestry were built and in 1970 the rewiring was undertaken. This again called for redecoration and the church took on its present look. The display unit which now stands at the rear of the church was made and erected in 1975. The centenary is marked by the necessity to begin extensive repairs to the flooring, woodwork, and roof struts, and to the exterior brick and stone work. It is hoped that this will be followed by another scheme of redecoration, both inside and out, in order that the building may enter its second century in a healthy state. The day to day cleaning and care of the premises have, from the opening until 1960, been in the care of a chapel keeper or caretaker. At the turn of the century he was paid £14.0.0. a year. By 1926 this had risen to £26.0.0. and by 1960 to £60.0.0. Shortly after this Mr. W. Blackeby took over the caretaking on a voluntary basis and continued this splendid service until his death in 1970. The present rota system of cleaning was then introduced. An early postcard view, 1903. The money for the building, furnishing and upkeep of the premises has been forthcoming in a variety of time honoured ways – donations, loans, grants, bazaars, teas, gift days etc. Much of the original building fund was gathered from loans payable at 4½% or 5% interest, while donations at the stone laying amounted to £97.7.3½ at the opening to £54.7.8½ and in response to the building appeal to £380.3.6. Another source of income available then was the seat rental. It was on the expectation of this steady inflow that the connexional grant of £50.0.0 was made in 1889. During the 1890s it amounted to between £3.0.0 and £6.0.0 a quarter. It is a salutary comment on the size of congregations that the trustees agreed that no seat should be held after five minutes before the start of a service. From the 1930s onwards pew rents were gradually overtaken by the envelope system but did not disappear entirely until 1946. It is sometimes said that no Methodist function is complete without a collection. This is a somewhat humourous gibe but nevertheless the collection has always been considered to be an integral and important part of worship. The collection journals show that at the turn of the century the Sunday offering was between £1.0.0 and £2.0.0 rising to about £6.0.0 on special occasions. In the 1930s it was between £3.0.0 and £4.0.0 rising to an average of £5.0.0 by 1960. These amounts have been augmented slightly by the class monies which were collected regularly until 1960. The society stewards cash book shows that of this incoming money only a small part has remained for the use of the local church; the majority has been paid to circuit funds or to outside causes. Among the latter have been Kingswood school, the National Childrens Home, the Theological Institute, Queen Victoria’s seamans trust, the Welsh miners, Northampton and Bedford General Hospitals and a variety of connexional funds. A clear picture of the church finances as they stood at about the middle of the century can be seen from the “summary of church a/c for the year 1936” taken from the society stewards book. The financial demands of the circuit are generally accepted as part of the Methodist way of life, for it relieves the individual church of many of the responsibilities which would fall to it under an autonomous system, but occasionally a voice of protest is discovered. 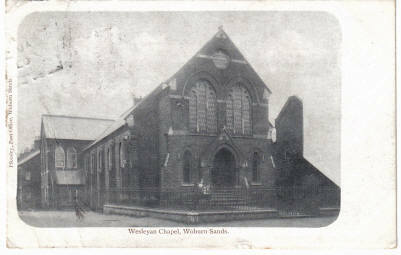 In 1927 the synod came to Wolverton and the circuit churches were asked to help with expenses. The Woburn Sands society donated £5.0.0 but a trustee decried it as a case of “cultivating the prestige of the circuit’ at the expense of its usefulness”. Succeeding generations have been conscientious guardians of property. Have they been equally loyal to the original ideals? It is difficult to gauge the spiritual temperature of a body of people from the minute books which they leave behind them, since for the most part they are a record devoid of emotion. One is forced to draw conclusions in terms of numbers and activities, helped by the memories of present members. There are no membership numbers recorded in the early years but one gains the imp­ression of a full church, a large Sunday school and several week night meetings as well as regular class meetings. Leaders meeting minutes are available from 1912 until 1961 but it is the circuit plans which provide the most information on the pattern of worship. The 11am and 6pm Sunday services date back until at least the early years of this century and a mid­week service was marked on the plan until 1970, at first on a Wednesday evening and changing during the 1930s to a Thursday. Until the arrival of the private car most preachers had double appointments in order to ease the transport problem. In the early years they would have journeyed on foot or by the circuit horse and trap which in due time was replaced by the hired car. There have always been some fully accredited and local preachers residing in Woburn Sands and at least three have answered the call to preach whilst in membership with the society. In 1926 Karl Gray and George Harter were admitted on trial and in 1938 Edith Perry received a note to preach and came on to full plan ten years later. The system of class meetings instigated by John Wesley was still very active when the church was built and was frequently acknowledged as a means of grace. As the years went by it gradually became an anachronism and in 1945 the class leaders meetings ceased to be listed in the circuit plan. The following extracts from the Woburn Sands entries indicate the decline. It would seem probable that the mid-week service and ministers class combined. After a public tea the opening concert began at 7 pm in the evening and the talents of many musicians were enjoyed. The festivities continued the following Sunday when, in addition to the normal services, an afternoon flower service was held. On the Monday the flowers were sent to the London hospital, East End. The organ was, of course at this time blown by hand, the organ blower receiving 1/- per quarter for his services. In 1906 the sewing meeting presented the church with a piano and another was purchased for the schoolroom in 1923. The present organ was installed in 1936 together with an electric blower and screen. The choir played a significant part in the life of the church in the early years and often prepared a cantata for the Good Friday service. These included “Daniel” in 1922, the “Crucifixion” in 1944 and in 1943 gave “Christ and His Soldier” on the evening of Palm Sunday and “Olivet to Calvary” at Easter. A secular opperetta was performed in 1934. During the war years the choir fell into decline but at the society meeting in 1947 they were said to be hopeful for a “renewal”. This hope would seem to have been justified for in 1951 “Olivet to Calvary” was again performed on the Good Friday. Since then, however the choir has gradually ceased to play a regular part in worship. In addition to the regular services evangelistic missions have been held from time to time throughout the century. Early in 1913 a letter was sent to the Home Missions department requesting an evangelist and it was arranged that Mr. Norwell should visit from September 20th until the 27th. Handbills and invitations were delivered by church members at the start of the month and 200 Evangelistic Mission books were held in readiness. Prayer meetings were held during the week proceeding Mr. Norwell’s arrival and before each evening meeting. The attendance was large at every meeting and “there was all through evidences of the Holy Spirit’s presence“. Forty six people gave their names to the missioner and are listed in the minute book as converts; Forty of them were senior members of the Sunday School. The evening after the mission closed, a praise and prayer meeting was held in the schoolroom and the following day a tea was given for sixty-four people. A similar mission was organised in 1934 and in 1951 the leaders meeting expressed concern about the people residing in the new estates in the village. After much discussion it was agreed that the minister, the society steward and the Sunday School superintendent should write a letter to be delivered by the young people of the church. Today it is fashionable to talk of ‘outreach’ rather than of ‘evangelism’ but in practice it is essentially the same. An integral part of the centenary programme is to reach out into the community with the good news of Jesus Christ. Although a campaign has a definite place in the missionary work of a church much evangelising is achieved at the level of personal friendship. In 1959 the Methodist Youth Department sent a letter to Guild secretaries saying that “Where neighbours and friends are brought into the church by sharing first of all in the fellowship of the Guild a real work of evangelism is being performed.” This is equally true of other activities and perhaps the first to come to mind is the Sunday School. When the church was opened Mr. H. Inwood was the superintendent of the school and he continued until 1919 thus completing 35 years of service. Although there are no records to confirm the fact it seems likely, that with such a splendid example before them the teachers and scholars prospered. The years from 1946 are covered by a register and so can be accurately tabulated. 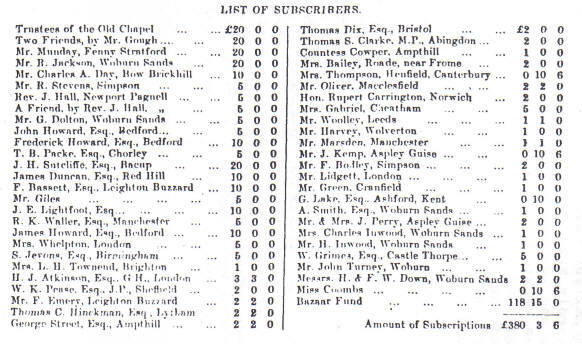 The first page shows that there were 13 girls and 5 boys in the senior classes, 16 girls and 18 boys in the middle classes and 19 children in the primary. This makes a total of 71 children who were taught by nine teachers. The school was open morning and afternoon with a total yearly morning attendance of 335 and afternoon attendance of 886. In 1936 the morning attendance was up to 460 and the afternoon to 1072 and in 1939 23 evacuee children joined the school. After the war the social change brought about by the arrival of the family car made it increasingly difficult to maintain both morning and the afternoon school and during the 1950s the afternoon attendance was stopped. Later the present practice of a 9.30 family service on the first Sunday of the month was adopted in order to encourage the parents of Sunday School scholars to share fully in the worship of the church. At the pre­sent time there are 27 children in the Junior church, 12 in the primary and seven in the beginners sections with a total of five teachers and three helpers. Throughout the century the evangelising work among young people has extended beyond the Sunday School to week night meetings. In the early years these were given a variety of titles – senior boys class, young mens class, Band of Hope, Junior Guild – but there is 110 detailed record until February 1951 when the Good Companions club was started and ran very successfully for two years. It began with 13 members and quickly rose to 25. It was affiliated to M.A.Y.C. and made good use of the facilities offered by the County Youth Service. They twice entered the Bletchley eisted­dfod and gave at least two dramatic performances in the school-room. In 1953 the club ran into disciplinary difficulties due to lack of leadership and was disbanded, since then a similar club has been launched whenever a suitable leader could be found, but at the present time there is no club in existence. However, the Boys Brigade is taking over the care of at least some of the youth. This was started in 1974 with three officers and 14 boys and four years later has doubled its ranks and gained another officer. The programme during the winter months covers formal instruction and Bible study to equip the boys for the adult world, and during the summer includes more informal out door pursuits including a battalion camp. The Methodist Church, as it appeared in Summer 2006. 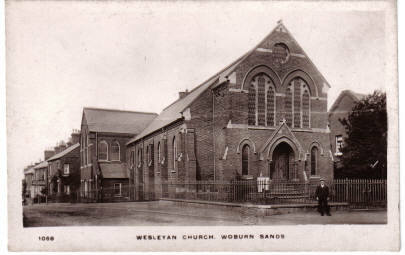 For many years within Wesleyan Methodism the Wesley Guild was a most actively supported week night meeting. After union in 1933 it became known as the Guild but retained its former pattern. The meetings were arranged under four headings – devotional, literary, Christian service and social – on a four week rota during the winter months. In the summer a variety of recreational pursuits were arranged including mystery coach tours, tennis evenings, and visits to local pleasure areas. A great deal of support was given to home and overseas missions arid as a result of annual rallies money amounting to £7.2.2 in 1940, £14.10.0 in 1941 and £13.0.0 in 1942 was raised for work abroad. About half these sums were donated specifically for the Ilesha hospital. At the annual meeting held in March 1950 the secretary reported a “disappointing session” and it would seem that the Guild was disbanded a few years later. Perhaps this was another comment on social change, this time in the shape of evening television viewing. Another branch of the church committed to missionary work was the very successful Girls League which was formed in the early 1940s and met until the mid-1950s. There are no records available of their meetings and our knowledge is based on the reminiscences of present church members. The membership range was from 13 to 30 and, like the Guild the meetings ranged from the devotional to the social, the latter including cycle rides and table tennis. 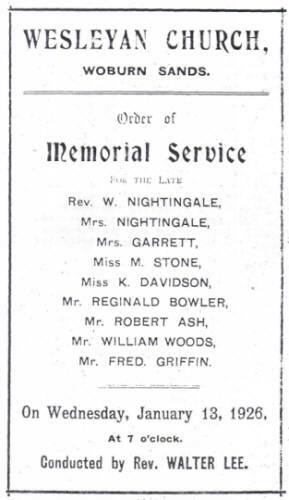 The league contributed to circuit life by taking Sunday evening services at Wavendon, Woburn and Aspley Guise, and missionary plays were put on to good audiences. Sales of work and jumble sales were organised to raise money for missionary funds. One day and weekend Girls League conferences were held within the London North West District and were regularly supported. At one time the secretary held district office and at least one of the conferences was held at Woburn Sands. The senior branch of the Girls League was Womens Work and this was also active in the church for many years. At the present time it is combined with the Womens Fellowship. The Juvenile Missionary Association has also been in existence for many years. A measure of the vitality of any body of people must be its ability to accept and adapt to change, whether from out side agencies or from a higher authority within its own organisation. The 1914-1918 war was the first happening to upset the even tenor of church life. The Band of Hope reacted very promply by arranging a concert in 1914 in aid of the Belgian Relief fund. Another interesting event was the egg collection made within the circuit and sent to London for sick and wounded soldiers. The Woburn Sands Church collected 127 eggs and the total provided by the circuit was 730. In 1917 the church premises were made available on each week day evening to the Canadian troops stationed locally for reading and writing classes; smoking was allowed in one room. The Guild held another meeting on Sunday evening after service. Also during that year two lantern lectures were given in aid of war savings. By the start of 1918 comments on the privations caused by the war are creeping into the minutes; it had become impossible to obtain a change of officers and all the church stewards were reappointed and, due to the shortage of food, the normal society tea was cancelled. On June 29th. 1920 a wel­come home was given to the demobbed soldiers and the war memorial tablet in the church was unveiled in 1922. During the Second World War the church premises were widely used, due to the requisitioning of the Institute, by local organisations such as the W.I., the county library, the Nursing Association, the allotment holders and the Guides. In 1942 the Bucks County Council requisitioned a classroom for blanket storage and the Ministry of Works claimed the railings. In the April a canteen was opened for H.M. Forces and in the first year they used 556 loaves to make 11,000 sandwiches, and sold 40,000 mugs of tea, 8,000 buns, 12,000 pastries and cakes and 400 large cakes. Gifts were also sent to church members serving in the forces. On December 7th, 1925 a tragedy, more immediately shocking than anything which occurred during either of the wars, befell the church. A party of Methodists from Aspley Guise and Woburn Sands had travelled to Bletchley by coach to hear an address given by the well known preacher Dinsdale Young and on the return journey the coach was hit by a train on the Fenny Stratford crossing. Eight people were killed and seven injured, four of them seriously. The Bedfordshire Times referred to the accident as “one of the most terrible that have occurred in the county for many years, and probably one of the worst motoring accidents on record“. During the mid-1930s the church had a problem, possibly of its own making, to surmount. There appears to have been a difference of opinion between the leaders meeting and the trustees meeting regarding the allocation of money. The society as a whole was very sensitive to this rift and at the annual society meeting it was proposed that the devotional life of the church should be strengthened by a week of prayer. This was heartily endorsed by the leaders but the matter was not finally resolved until the following September. Then the Chairman of the District met the disagreeing factions and put the finances on a sound footing “according to Methodist rule and usage“. The most recent changes which the church has been called upon to assimilate are those caused by the proximity of a rapidly growing city and paramount among them is the need to think ecumenically. Advancement is so urgent that sectarian prejudices must be laid aside. During the first half of the century there was very little joining together of denominations, not even for armistice day or the King’s jubilee. However, in 1957 the Guild minutes record that “we created history by having a Roman Catholic priest to speak at one of our devotional evenings“. Since then the churches in Woburn Sands have moved towards each other as far as their differing rules will allow and the Churches Central Committee, the ecumenical prayer group and United Christian Service are all well established parts of church life. With this experience of unity to draw upon the church should be well equipped to support the circuit in Milton Keynes. Of the changes occurring within Methodism the first was the act of union in 1932. At the annual society meeting the minister “pleaded very earnestly for real unity without which he said Methodist Union would end in fiasco“. A willing spirit must have prevailed on both sides since some “ex-Prims” were still counted among the members of the church. More recently the church has had to exercise patience and flexibility in coming to terms with the new organisation made necessary by the Methodist Church Act. Prior to this, more over, the members were asked to welcome as their minister an industrial chaplain who would be very committed to Milton Keynes. The continuing success of this arrangement is a tribute to all concerned. As one reads through the minute books one is continually impressed by the frequency with which the names of certain lay men and women occur. The church must have been richly blessed by such as those throughout the century. Mr. H. Inwood for instance, who kept a gentleman’s outfitters in the High Street, and who was a trustee, Sunday School superintendent, choir master and class leader. Mr. and Mrs. Wingrave who were chapel steward and poor steward respectively from 1913 until 1924 Mr. Kent, a local preacher and quarterly meeting secretary, also gave ten years service to his local church as steward and Sunday School teacher during the 1920s. Perhaps the longest serving society steward was Mr. Piper who was in office from before the second world war until 1952, making a total of 16 years continuous service. This record is only broken by Miss Spinney who was poor steward for the twenty years from 1936 until 1956. The church is indebted to Miss Spinney for a legacy from which money was borrowed to pay the repair bill in 1961. Many can still remember the goodness of Bill Blackeby and Will Smith who became society stewards together in 1960 and who had both been associated with the church since the 1920s. Will Smith had entered the Sunday School as a teacher in 1926 and subsequently became superintendent. Mrs. Smith was also a founder member of the Women’s Fellowship and served many years as J.M.A. secretary. To do their Master’s will. Past Ministers and Superintendent Ministers return to conduct Sunday worship. July 15th Rev. J. Bailey Chapman. Saturday Oct. 13th Church at. Home Day. Saturday Nov. 10th Family Gathering for Members and Ex-members. Advent – Distribution of Christmas leaflet. 1980 Sun. Jan. 20th United Service. Easter Day (April 6th.) United Evening Service conducted by Local Ministers and in which the members of the Study Groups will share. Christian Aid Week – Special effort to show our outreach in caring. September – Distribution of Gospels with Special Services at the beginning and end of the period. 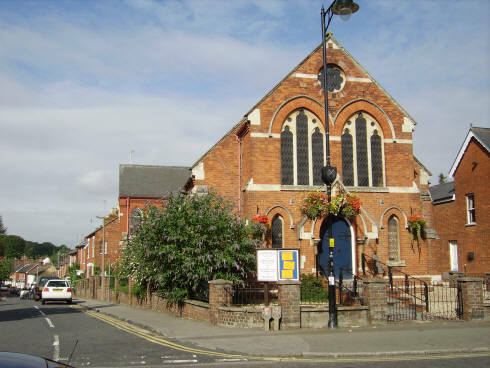 It is hoped to arrange throughout the year a series of Evening Forums in each of the local Churches to make known the work of some of the Outreach and Caring Agencies of each of the Churches. We also hope to hold Coffee Mornings and Evenings when the Churches collectively and Christians individually can be “At Home” to those normally outside our fellowship. Finally, we are also hoping to encourage U.C.S. to repeat their extremely successful Exhibition of 1978, and to arrange some Consultations on Caring with people in the various statutory and voluntary agencies.